Team Sky are set to announce a new sponsor - owned by Britain's richest man Sir Jim Ratcliffe. The broadcaster said in December that it would end its decade-long commitment at the end of 2019, during which time Team Sky have won eight Grand Tours. The team will be renamed Team Ineos - after the chemicals giant that billionaire Ratcliffe owns. Ratcliffe is worth £21bn and has been in talks with Team Sky principal Dave Brailsford for several weeks. Team Sky was launched in January 2010 and has since amassed 327 victories, including those eight Grand Tour triumphs. 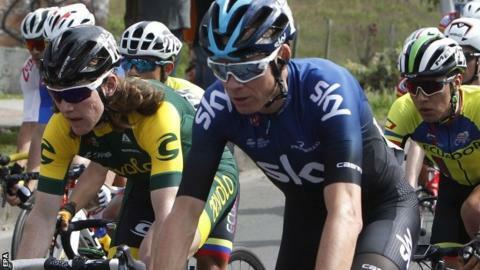 Current riders Chris Froome and Geraint Thomas have won five Tours de France between them, and Welshman Thomas signed a new three-year deal in September after winning his first Tour last July. Ineos is Britain's largest privately owned company and in 2018 posted annual pre-tax profits of £2bn. Ratcliffe has already invested £110m in Ben Ainslie's Americas Cup team. Former Team Sky rider Bradley Wiggins, who won the 2012 Tour de France, said the partnership between Brailsford and Ratcliffe could be "ideal". Talking on Eurosport's The Bradley Wiggins Show, he said: "I think he would have been reluctant to have another multinational company that came in and wanted the control in terms of 'this is how we advertise our company'. "Ratcliffe is the richest man in Britain and you would imagine that the kind of money they have asked for is nothing to him. "Dave can continue running this team with all his plans and philosophies, so it's an ideal situation for him and you'd imagine he is answerable to one man." Team Sky have dominated the Tour de France in recent years, winning six of the past seven editions, while Froome also won the 2017 Vuelta a Espana and the 2018 Giro d'Italia. However, the efficient style and big spending that underpinned Sky's success has been unpopular with some fans, particularly in France. The team has also been subject to allegations of cheating. Froome, 33, had an anti-doping case brought against him and subsequently dropped by governing body the UCI, while former rider Bradley Wiggins has faced questions over his use of a medical exemption for hayfever medication. The UK Anti-Doping Agency also conducted a 14-month investigation into a 'mystery package' delivered to then-team doctor Richard Freeman on the final day of Wiggins' successful Criterium du Dauphine bid in 2011. Team Sky, Froome and Wiggins deny any wrongdoing in all three cases. This has been a remarkable turnaround in fortunes for arguably the country's most successful and controversial sports team. Only a year ago, a group of MPs accused Team Sky of "crossing the ethical line". Although that was denied, once Sky announced it was pulling out, the future looked bleak. Some felt team boss Sir Dave Brailsford's bid to find a saviour could be scuppered by the medical tribunal of the team's ex-doctor. Richard Freeman denied a charge that he ordered a mystery delivery of testosterone to help a rider to cheat. But the case was bogged down in legal argument, then adjourned, damaging headlines were avoided, and now the team has been saved. From TUEs to jiffybags, Sir Jim Ratcliffe will have weighed up the team's various scandals in recent years, but concluded their unprecedented success is worth being associated with. This will come as a huge relief to the team's staff and fans who will be delighted that its star riders will now stay. Others however will be concerned that the dominance of cycling's wealthiest team could continue, making races too predictable. Joining forces with Ratcliffe allows the team to preserve its British identity, although some will point out reports of the billionaire's controversial recent move to Monaco for tax reasons.